Know the four elements of navigation. 1. State how the Earth’s size and shape affect navigation. 2. State how to determine position. 3. State how to determine direction. 4. State how to determine distance. 5. State how to determine time. 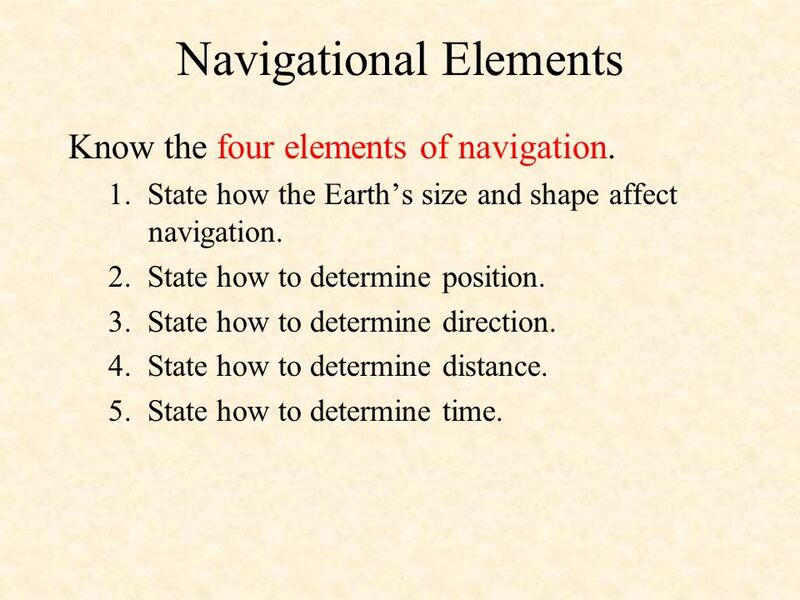 Lesson Objective: Know the four elements of navigation. Samples of Behavior/Main Points 1. State how the Earth’s size and shape affect navigation 2. State how to determine position. 3. State how to determine direction. 4. State how to determine distance. 5. State how to determine time. 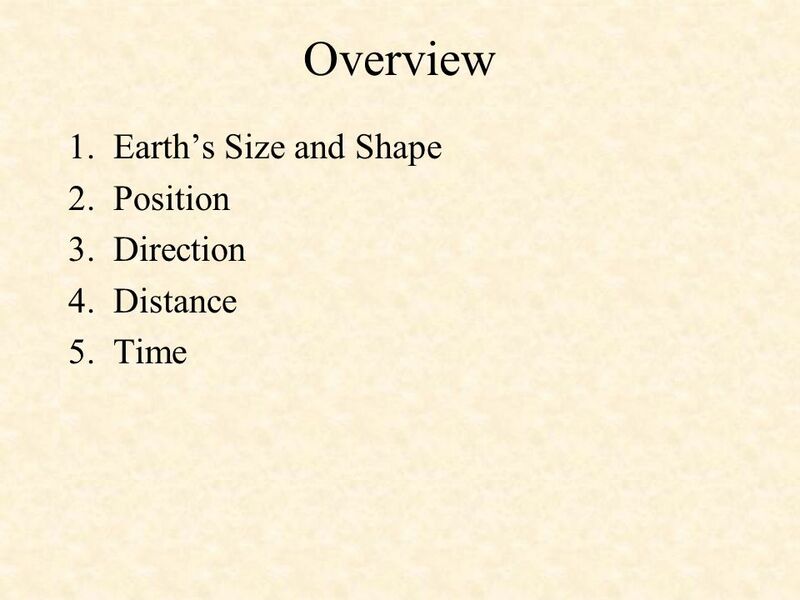 3 Earth’s Size and Shape For most navigational purposes, the Earth is assumed to be a perfect sphere. Measured at the equator, the Earth is approximately 7, miles in diameter, and the diameter through the poles is approximately 7,901 miles. 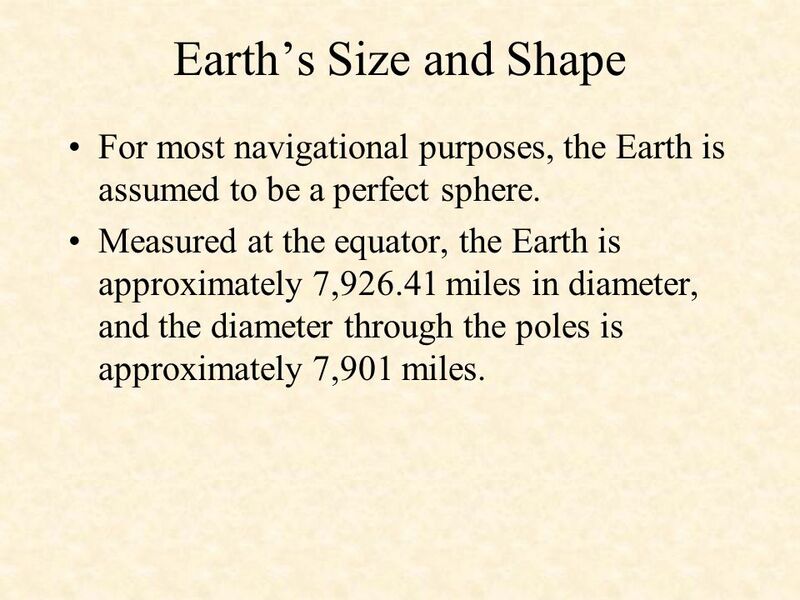 Earth’s Size and Shape For most navigational purposes, the Earth is assumed to be a perfect sphere, although, in reality, it is not. Measured at the equator, the Earth is approximately 7, miles in diameter, and the diameter through the poles is approximately 7,901 miles. The difference of approximately 25 miles does not prevent us from assuming the Earth to be spherical for navigation purposes. This assumption has proved to be practical since, for centuries, navigator’s on the water and in the air have reached their destinations based on it. Defined as a circle on the surface of a sphere whose center and radius are those of the sphere itself. It is the largest circle that can be drawn on the sphere. 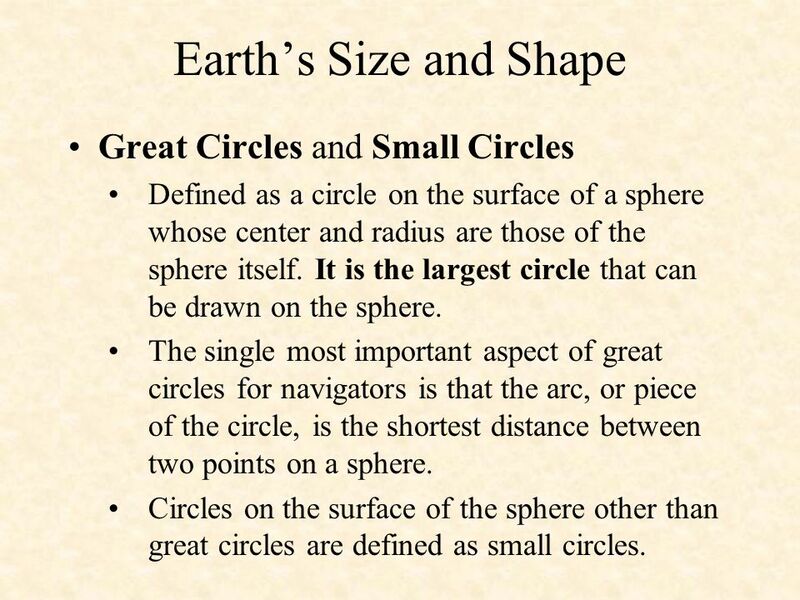 The single most important aspect of great circles for navigators is that the arc, or piece of the circle, is the shortest distance between two points on a sphere. Circles on the surface of the sphere other than great circles are defined as small circles. Great Circles and Small Circles Defined as a circle on the surface of a sphere whose center and radius are those of the sphere itself. It is the largest circle that can be drawn on the sphere. The equator and meridians are examples of great circles. The single most important aspect of great circles for navigators is that the arc, or piece of the circle, is the shortest distance between two points on a sphere. Circles on the surface of the sphere other than great circles are defined as small circles. All latitudes, with the exception of the equator are small circles. 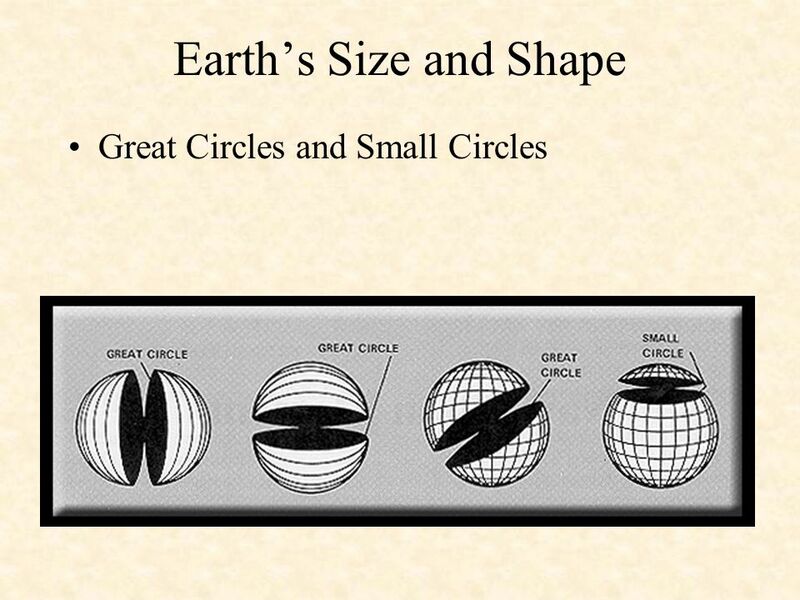 5 Earth’s Size and Shape Great Circles and Small Circles . 6 Position Lines of reference are necessary in order to locate specific points on the Earth. These lines are known as parallels of latitude and meridians of longitude. The numbers representing a position in terms of latitude and longitude are known as coordinates of that position. 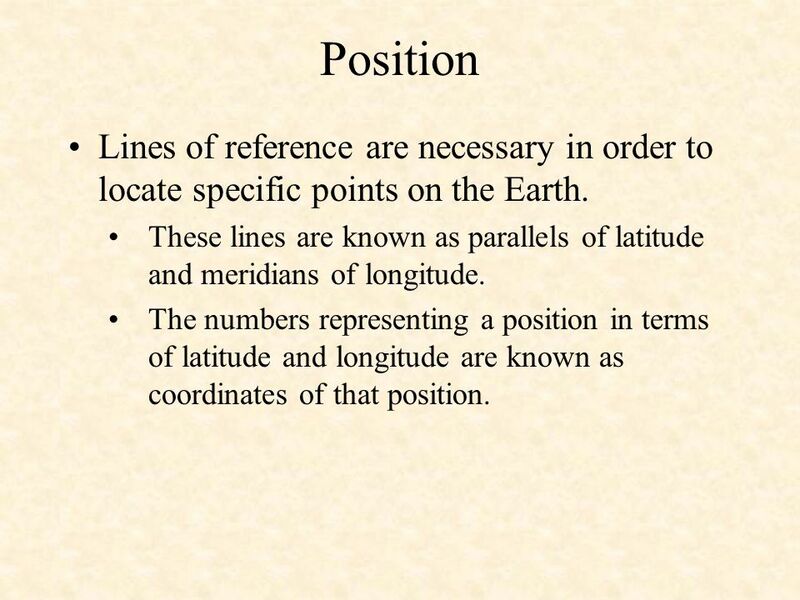 Position Lines of reference are necessary in order to locate specific points on the Earth. A system using imaginary reference lines has been developed to locate positions on the Earth. These lines are known as parallels of latitude and meridians of longitude. 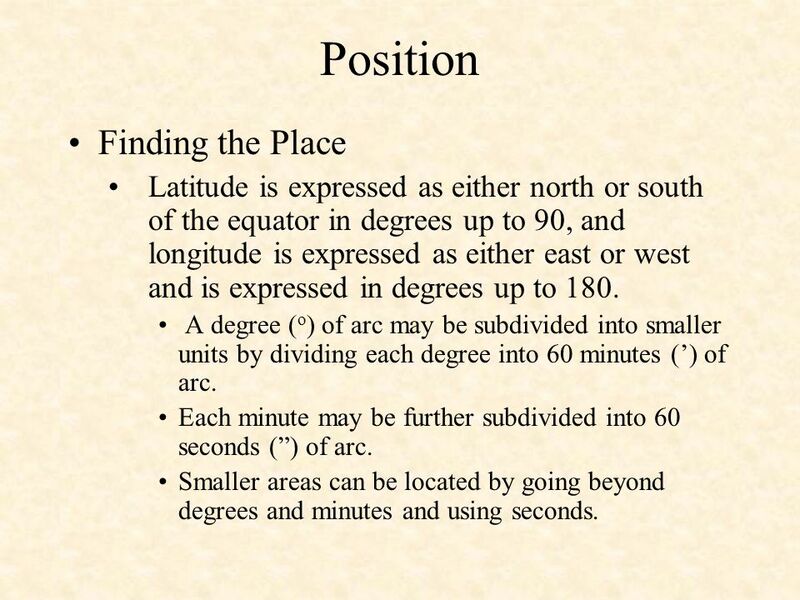 The numbers representing a position in terms of latitude and longitude are known as coordinates of that position. 7 Position Latitude The equator is a great circle midway between the poles, and its plane is perpendicular to a line connecting the poles. Latitude The equator is a great circle midway between the poles, and its plane is perpendicular to a line connecting the poles. 8 Position Latitude The location of the latitude is determined by figuring the angle at the center of the Earth between the latitude and the equator. 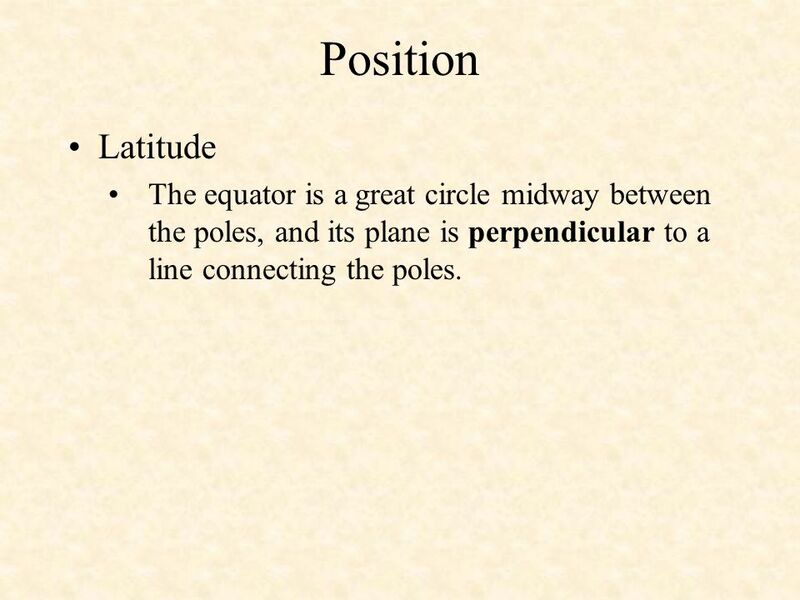 Parallel with the equator are lines of latitude. Each of these parallel lines is a small circle, and they have a definitive location. 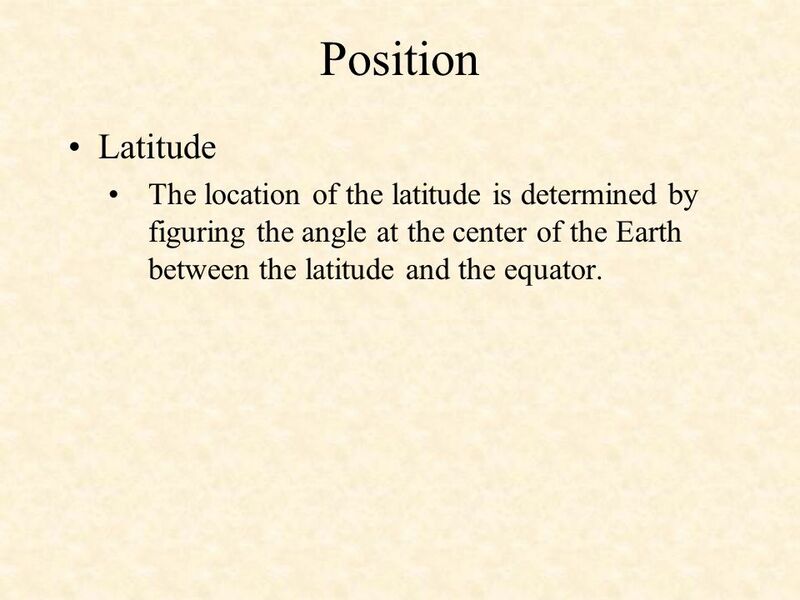 The location of the latitude is determined by figuring the angle at the center of the Earth between the latitude and the equator. The equator is latitude 0°, and the poles are located at 90° latitude. Since there are two latitudes with the same number, the letter designators N and S are used to show which latitude is meant. The North Pole is 90°N and the South Pole 90°S. The area between the poles and the equator are known as the Northern and Southern Hemispheres. 9 Position Longitude Indicates east-west location. There is no natural starting point for numbering longitude. 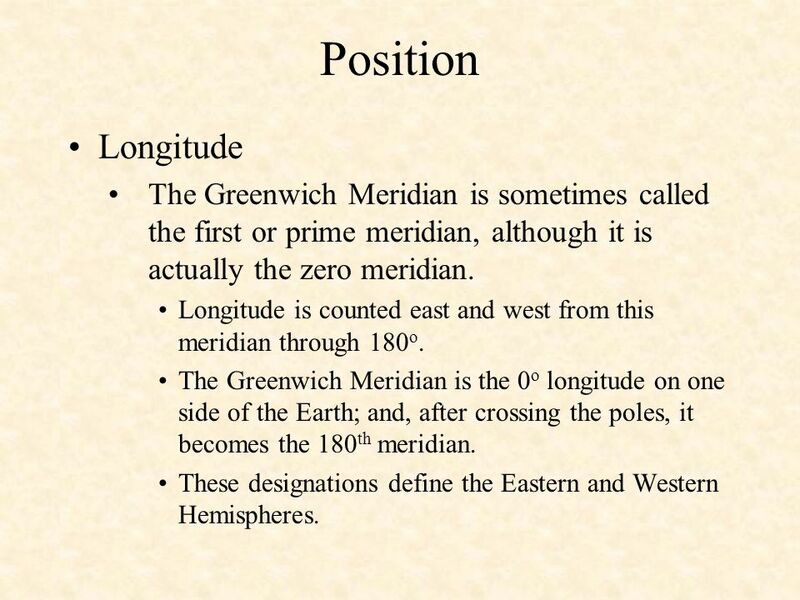 When the English-speaking people began to make charts, they chose the meridian through their principle observatory in Greenwich, England, as the zero degree line. Longitude Indicates east-west location. There is no natural starting point for numbering longitude. Therefore, the solution has been to select an arbitrary starting point. Many places have been used. 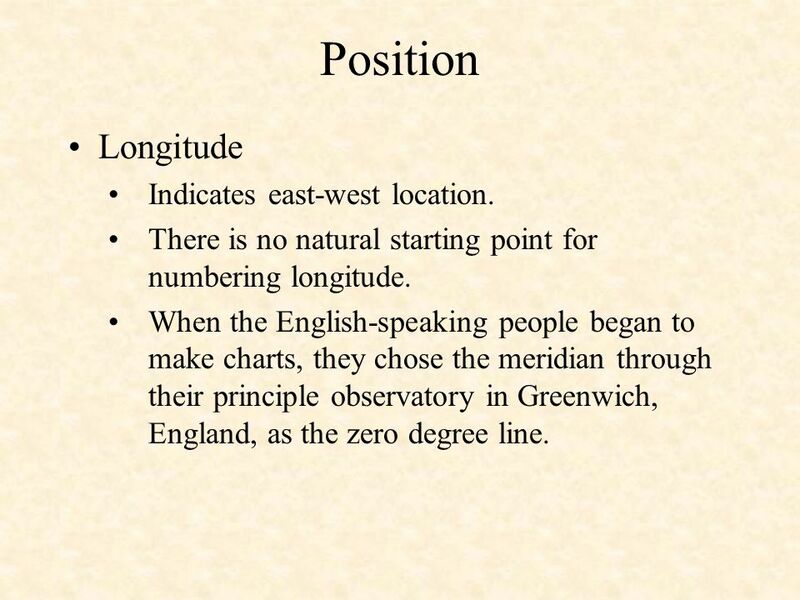 When the English-speaking people began to make charts, they chose the meridian through their principle observatory in Greenwich, England, as the zero degree line. Most other countries of the world have now adopted this line. 10 Position Longitude The Greenwich Meridian is sometimes called the first or prime meridian, although it is actually the zero meridian. Longitude is counted east and west from this meridian through 180o. The Greenwich Meridian is the 0o longitude on one side of the Earth; and, after crossing the poles, it becomes the 180th meridian. These designations define the Eastern and Western Hemispheres. The Greenwich Meridian is sometimes called the first or prime meridian, though, actually, it is the zero meridian. Longitude is counted east and west from this meridian through 180o. The Greenwich Meridian is the 0o longitude on one side of the Earth, and, after crossing the poles, it becomes the 180th meridian (180o east or west of the 0o meridian). These designations define the Eastern and Western Hemispheres. If a globe has the circles of latitude and longitude drawn upon it and if the latitude and longitude of a place has been determined, a given point can be located on the globe in its proper position. 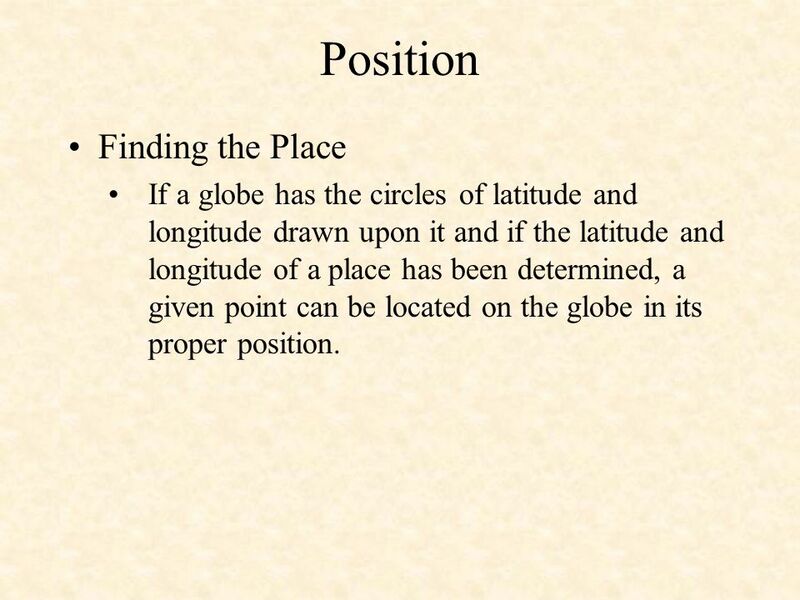 Finding the Place If a globe has the circles of latitude and longitude drawn upon it and if the latitude and longitude of a place has been determined, a given point can be located on the globe in its proper position. Latitude is expressed as either north or south of the equator in degrees up to 90, and longitude is expressed as either east or west and is expressed in degrees up to 180. A degree (o) of arc may be subdivided into smaller units by dividing each degree into 60 minutes (’) of arc. Each minute may be further subdivided into 60 seconds (”) of arc. Smaller areas can be located by going beyond degrees and minutes and using seconds. Latitude is expressed as either north or south of the equator in degrees up to 90, and longitude is expressed as either east or west and is expressed in degrees up to 180. A degree (o) of arc may be subdivided into smaller units by dividing each degree into 60 minutes (’) of arc. Each minute may be further subdivided into 60 seconds (”) of arc. Smaller areas can be located by going beyond degrees and minutes and using seconds. 13 Direction Direction is the position of one point in space, relative to another, without reference to the distance between them. 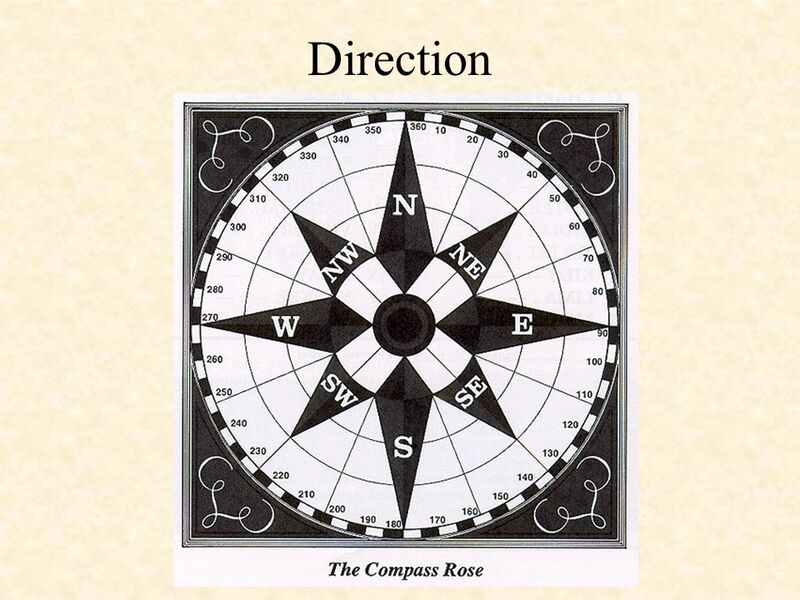 The points of a compass are not adequate for modern navigation. It has been replaced, for the most part, by a numerical system. 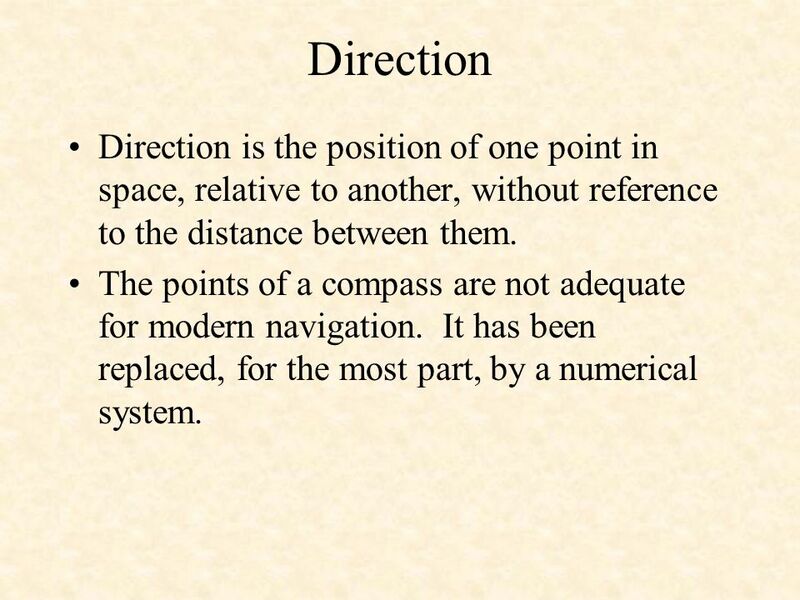 Direction Direction is the position of one point in space, relative to another, without reference to the distance between them. The points of a compass are not adequate for modern navigation. It has been replaced, for the most part, by a numerical system. The numerical system, divides the horizon into 360°(degrees). Starting with north as 000° and continuing clockwise through east (090°), south (180°), west (270°), and back to north. This circle, called a compass rose, represents the horizon divided into 360°. 14 Direction Direction Direction is the position of one point in space, relative to another, without reference to the distance between them. The points of a compass are not adequate for modern navigation. It has been replaced, for the most part, by a numerical system. 15 Direction Since determination of direction is one of the most important parts of the navigator’s work, the various terms involved should be clearly understood. 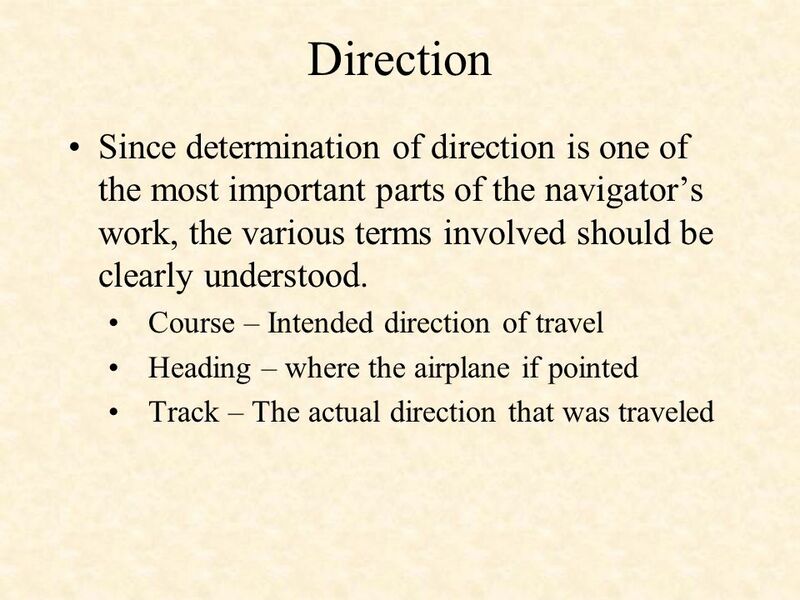 Course – Intended direction of travel Heading – where the airplane if pointed Track – The actual direction that was traveled Since determination of direction is one of the most important parts of the navigator’s work, the various terms involved should be clearly understood. Course is the intended horizontal direction of travel. Heading is the horizontal direction in which an aircraft is pointed. 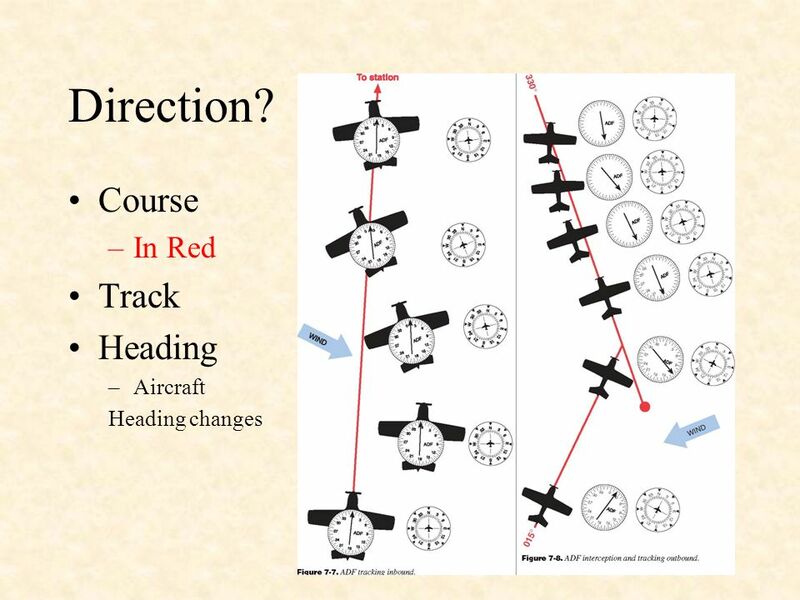 Heading is the actual orientation of the longitudinal axis of the aircraft at any instant. 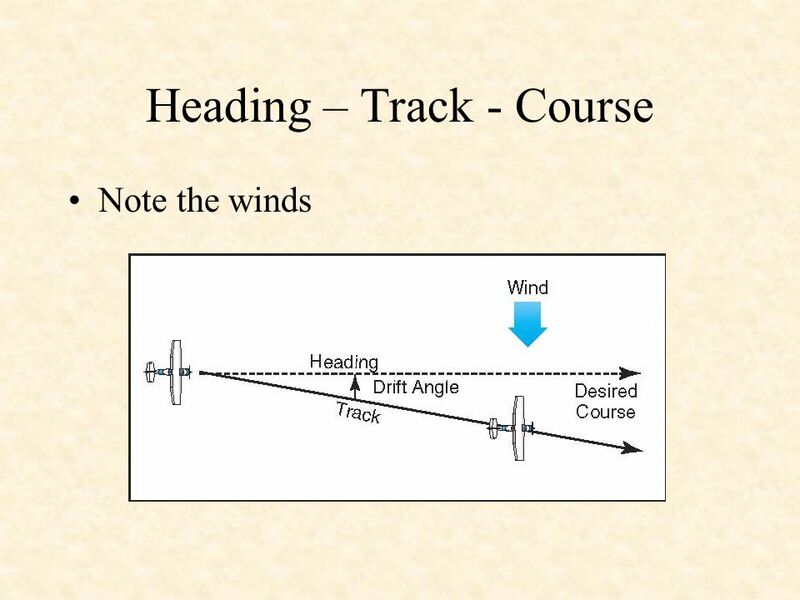 Track is the actual horizontal direction traveled by the aircraft over the Earth. 18 Direction A line that makes the same angle with each meridian is called a rhumb line. Flying this sort of path results in a greater distance traveled, but it is easier to steer. Between two points on the Earth, the great circle is shorter than the rhumb line, but the difference is negligible for short distances (except in high latitudes). 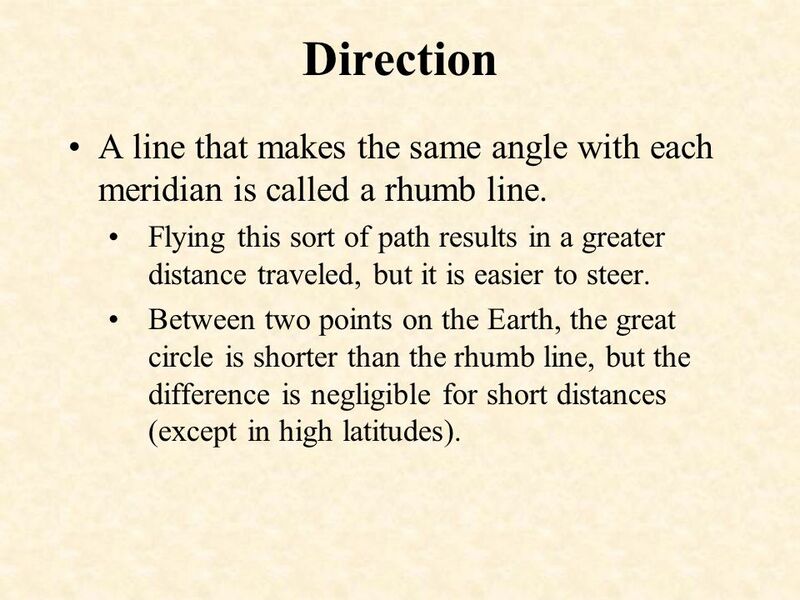 A line that makes the same angle with each meridian is called a rhumb line. An aircraft holding a constant true heading would be flying a rhumb line. Flying this sort of path results in a greater distance traveled, but it is easier to steer. Between two points on the Earth, the great circle is shorter than the rhumb line, but the difference is negligible for short distances (except in high latitudes). 19 Distance Measured by the length of a line joining two points. In navigation, the most common unit of measuring distance is the nautical mile. The nautical mile is about 6,076 feet. Equal to 1 minute of arc on a meridian, which is 1 minute of latitude. To convert nautical miles to statute miles, the nautical mile figure can be multiplied by the factor 1.15. To convert statute miles to nautical miles, multiply the statute miles by 0.87. Distance Measured by the length of a line joining two points. In navigation, the most common unit of measuring distance is the nautical mile. The nautical mile is about 6,076 feet (sometimes rounded to 6,080 feet). Equal to 1 minute of arc on a meridian, which is 1 minute of latitude. To convert nautical miles to statute miles, the nautical mile figure can be multiplied by the factor 1.15. 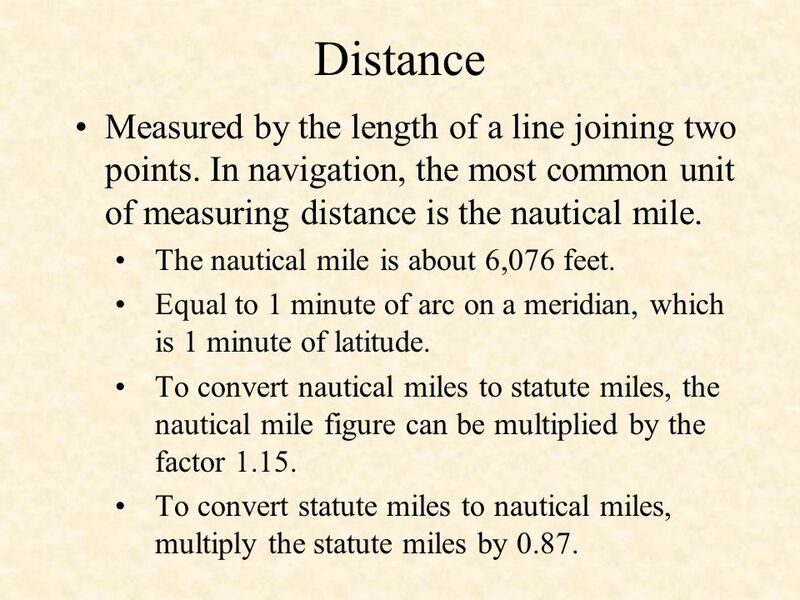 To convert statute miles to nautical miles, multiply the statute miles by 0.87. 20 Distance Speed is closely related to the concept of distance, which determines the rate of change of position. 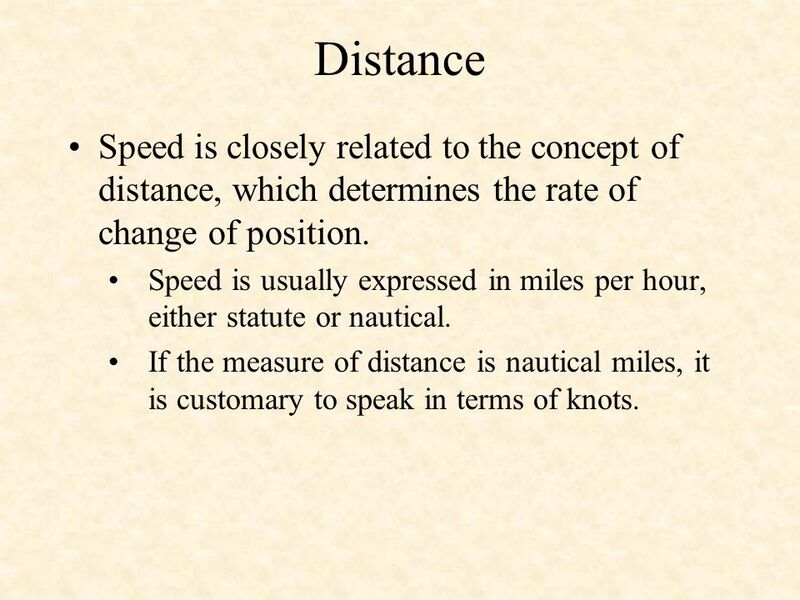 Speed is usually expressed in miles per hour, either statute or nautical. If the measure of distance is nautical miles, it is customary to speak in terms of knots. Speed is closely related to the concept of distance, which determines the rate of change of position. Speed is usually expressed in miles per hour, either statute or nautical. If the measure of distance is nautical miles, it is customary to speak in terms of knots. 21 Time The Earth makes a complete rotation of 360o during a 24 hour day. Zone Time Before the establishment of zone time in 1883, every city and town had its own time. 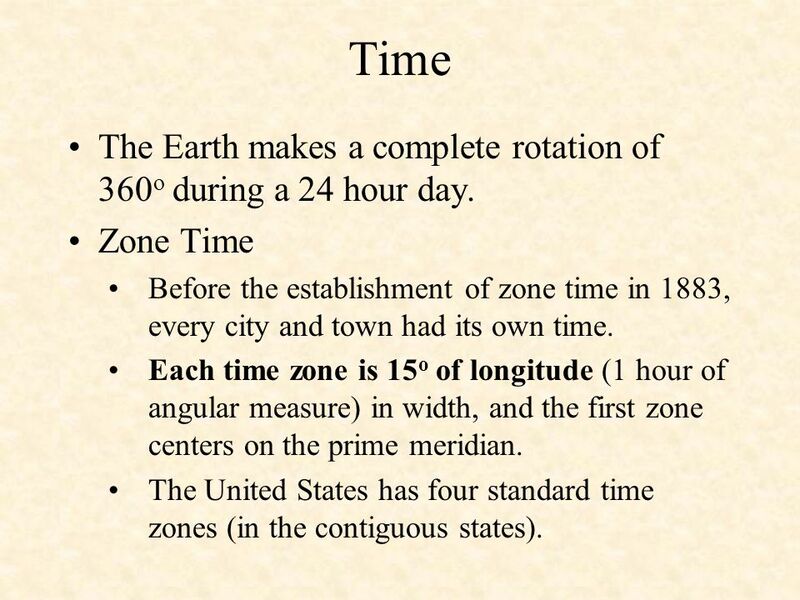 Each time zone is 15o of longitude (1 hour of angular measure) in width, and the first zone centers on the prime meridian. The United States has four standard time zones (in the contiguous states). Zone Time Before the establishment of zone time in 1883, every city and town had its own time. 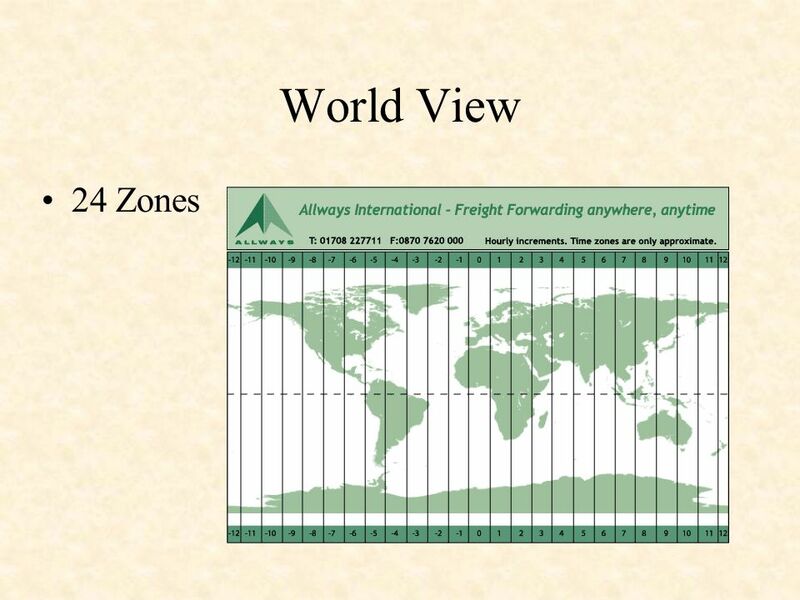 Each time zone is 15o of longitude (1 hour of angular measure) in width, and the first zone centers on the prime meridian. Irregularities have crept into the system. Some towns have decided to keep the time of some large city further east or west. Daylight Saving Time, which sets the clocks one hour ahead in the affected areas. The United States has four standard time zones (in the contiguous states). The time in any given zone is 1 hour earlier than in an adjacent eastern zone and 1 hour later that in an adjacent western zone. Pilots sometimes become confused in reporting their estimated time of arrival (ETA) because they cannot remember whether they must add or subtract an hour. The use of Greenwich Mean Time (GMT) avoids the necessity of considering time zones. GMT is the time of day at any given moment at Greenwich, England. 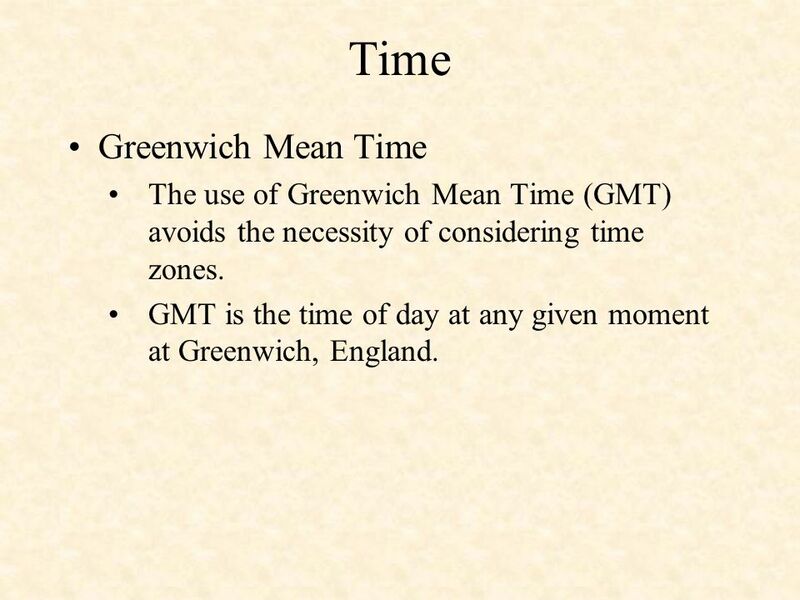 Greenwich Mean Time The use of Greenwich Mean Time (GMT) avoids the necessity of considering time zones. GMT is the time of day at any given moment at Greenwich, England. Greenwich time is often noted on communications and Teletype reports as Z. 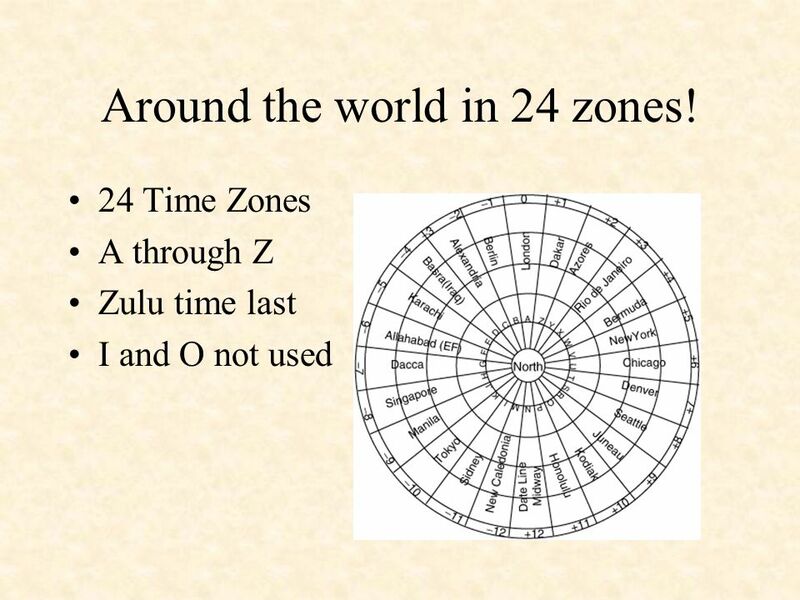 It is therefore often called “Zulu” time, in accordance with the International Phonetic Alphabet. 23 Around the world in 24 zones! Viewpoints Chapter 6, Section 2. Astronomy Class Notes Jim Mims. CHAPTER ONE FINDING YOUR WAY. Where on Earth are You?. 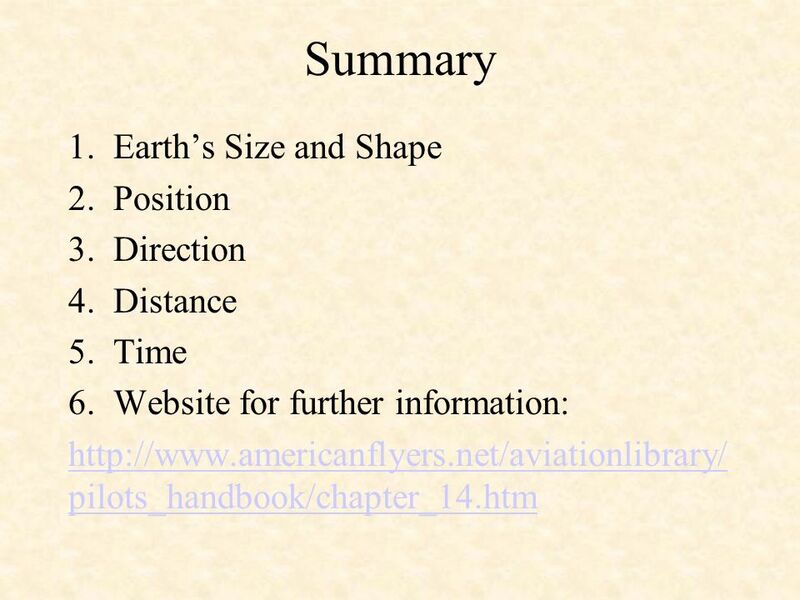 Navigation Basics AST 241 From Van Sickle’s Modern Airmanship chapter 11 6 th ed.